Torch on Membrane Roofing Toronto, GTA (modified bitumen system) - Pro Roofing Inc. Modified bitumen roof, also known as torch on roofing or torch on roof, is an asphalt based system designed for low-slope or flat buildings. Call 647 - 521 - 7883 or get a quote online. Explore more flat roofing options. While modified bitumen serves as the final layer, there are other elemements which together with MB form a roofing system. Modified Bitumen roofs possess increased resistance to cold temperatures, great flow resistance at high temperatures and increased elasticity. There are numerous options available for this system which include factory applied mineral surface, gravel surface and highly reflective "cool surfaces" designed to reflect sun rays. There are a variety of colours available to match shingles or other design elements. 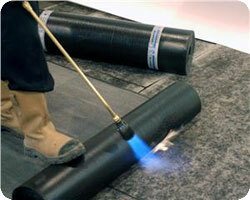 Modified bitumen roofing system can be installed using hot fire torch, or a "hot-mop". Some manufacturers offer self adhering rolls. I used Pro Roofing to repair flat roof on my garage. Ivan came to my house to give a free estimate for a new roof. This is exactly what I wanted. He went up on the roof and assessed it, inviting me up with him to show the roof condition and explain what needed to be done. The roof itself is modified bitumen, and Ivan recommended full tear off and replacement. There were 2 layers of roofing, overlaid on rafters that were not sufficient over the wide span of my 3 car garage. It would be a costly job, something I did not quite have the budget at the time. What I liked about him is he suggested is a repair until I could afford the full replacement. It's now been over 2 months since the repair and there are no leaks. Recommend them if you need repairs, and I will be calling them for replacement.